Collins Booksellers - 100 Most Asked Questions About the Bible by Pastor James R. Reese Jr., 9781463434670. Buy this book online. by Pastor James R. Reese Jr. Whether you are just beginning your Personal Walk with God or have been on this highly significant journey for years, there are always questions that may not be discernable due to the living, growing, complex nature of the message of God’s Word; the Bible. Readers of this “God-breathed” Word often get distracted from its central theme; to know Jesus the Christ, by issues pertaining to the people, the situations, the rituals, the doctrines, and the stories they have heard, and maybe not read, which have been handed down for generations. This book is a collection of real questions asked by everyday people, Christians and those seeking to be Christians, on subjects ranging from “Jonah and the Whale” and “How to become a Christian”, to the actual validity of the Bible itself. 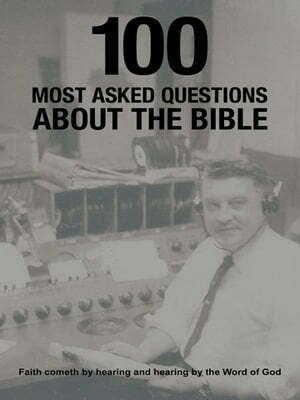 The answers were broadcast on a weekly radio show by Pastor James R. Reese Jr. who’s Pastoral career spanned well over 60 years. It is an excellent source to accompany any Bible Study or just to pick up and begin reading. The first draft of this book was taken from the actual recordings of his broadcasts which took place in several different states over a time period of 50 years. The manuscript was first typed by Pastor James R. Reese Jr. himself on a now considered antique manual typewriter. It was then carried around in a box for many more years. At the urging of Pastor James R. Reese Jr.’s son, Pastor Scott Reese, the box was finally opened and its contents put on a computer file in 2003. The final editing began in 2010 and was completed in May of 2011 for presentation to the publisher. This book contains a wealth of information and knowledge inspired by a man who let his light shine “…before men, that they may see your good works, and glorify your Father which is in heaven” (Matthew 5:16). The completion of this book has been a labor of love for all of us involved and we pray that you will follow Pastor James R. Reese’s light and let your own light shine.